Pet rats come in a rainbow of colors, but most are descended from the brown rat, or Rattus norvegicus. Although domestic rats usually belong to the same species, each is distinguished by the appearance of his coat, whiskers, markings, ear size and eye color. 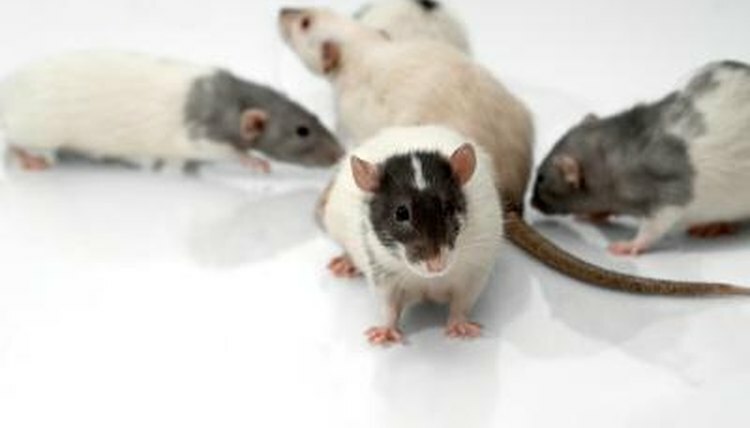 Different types of rats belong to different varieties; this is unlike dogs, who are classified by breed. The Rat and Mouse Club of America identifies four main varieties of rats: standard, rex, hairless and tailless. In addition, the American Fancy Rat and Mouse Association recognizes satin and dumbo rats. The National Fancy Rat Society recognizes many varieties, but it has banned tailless and hairless rats from exhibition in the United Kingdom. The standard rat variety has short, sleek fur that nearly gleams with a glossy finish. The female has longer, softer fur than the male. The hairless rat is bald with pink, thin skin that is nearly translucent. If he has whiskers, they are short and curly. His hairlessness is caused by a genetic mutation, and people with fur allergies might appreciate his baldness. The National Fancy Rat Society says the lack of fur makes this rat susceptible to cold and injury. The tailless rat is sometimes called the Manx rat, a nod to the tailless Manx cat. In fact, a tailless rat sometimes has a hint of a tail or a short, furry stub where the tail would be. The National Fancy Rat Society has banned exhibition of the tailless rat because a rat's tail helps him regulate his body heat and is considered necessary for robust health. The dumbo rat variety is distinguished by the size and shape of his ears, which are larger and rounder than those of other varieties. They are shaped somewhat like a rose petal and are positioned low on the sides of his head. The coat can vary in color. The rex fancy rat has a curly coat and whiskers. His dense, soft coat comes in many colors, and it lacks the guard hairs that make rat fur coarse. This unusual coat makes him a good pet for people who are allergic to other rats, according to the book "Pet Rats." The satin variety is known for its shiny, silky coat and curly whiskers. The coat is said to have a metallic sheen. Marked varieties of rats generally sport two colors of fur that form patterns. For example, the capped variety has a body that's solid white and a head with a cap of color that stops at the ears. The Irish variety sports a white triangle on the chest, plus white feet and a body fur of a different shade. The National Fancy Rat Society lists 11 marked varieties. "Any Other Varieties" of fancy rats include topaz, lilac agouti, cinnamon pearl and silver fawn. These names point to each rat's coloration. In addition to the more well known varieties, the National Fancy Rat Society recognizes at least 21 new varieties. These have poetic or exotic names such as powder blue, quick silver, cinnamon chinchilla, Russian pearl and sable Burmese.